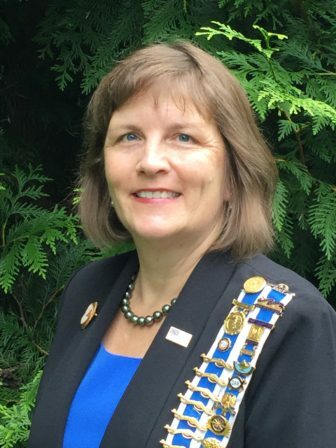 Katherine Love, regent of Darien’s Good Wife’s River Chapter of the Daughters of the American Revolution, was elected Connecticut State DAR treasurer for 2019 to 2022 on Saturday, April 13, at a CTDAR state conference. She was elected as a member of the Hendrie Associates slate at the 126th CTDAR State Conference held at the Red Lion Hotel in Cromwell. Katherine joined the DAR in 2006 and has been active in the organization at both the local and state levels. At the Darien chapter, she has been regent, vice regent and 2nd vice regent. She initiated a Chapter Project to fundraiser, erect and dedicate the first endorsed DAR Marker in celebration of the NSDAR 125th anniversary in September 2015. This marker honors Revolutionary War soldiers and is located in the Veterans Circle at the Darien Town Hall. At the state level, Katherine served as assistant state treasurer for three years and is the Special National Committee chair for special projects grants. She also has served as chairman/co-chairman of the Bylaws, History, Scholarship, Schools, and VIS committees. Love also serves as treasurer of the Governor Jonathan Trumbull House and Wadsworth Stable Committee. She is a Heritage Club member and was co-hostess and co-organizer of President General Lynn Forney Young’s Guardian Trust Campaign visit to Stamford in April 2016. Katherine will travel to Washington, D.C. to attend the NSDAR 128th Continental Congress where she will serve on the Registration Committee in June 2019. She is a graduate of Mount Holyoke College with a BA, and was business manager/ bookkeeper for the Connecticut Non-Profit Institute for over 20 years. She has also held management positions in the banking, restaurant and retail industries. Katherine is a graduate of GEP I, II, and III courses offered by NSDAR. She is married and has three children.